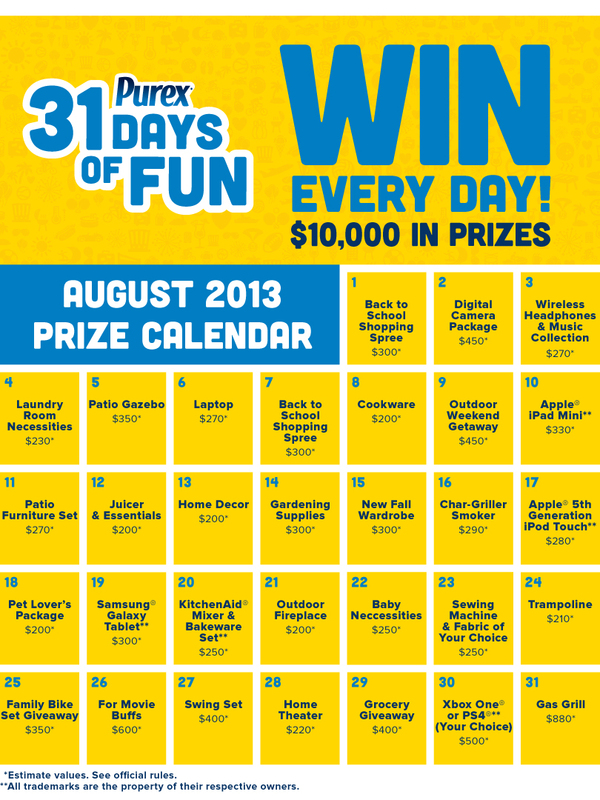 Starting August 1st and every day during August, you can win a prize in Purex 31 Days of Fun Sweepstakes! As you can see from the calendar below, there are many fantastic prizes to win. On August 1st and 7th, the giveaway is a $300 Back To School Shopping Spree! With school starting back up, I know everyone would love to win this! I also like the giveaway for the Outdoor Fireplace on August 21st. With cooler weather on it's way, this would be a lovely addition to any patio or outdoor space. If you love movies as much as I do, there is a prize on August valued at $600 For Movie Buffs. I know that would be a hit in my household. On the last day of the Purex 31 Days of Fun Sweepstakes, there is a gas grill valued at $880! I know I grill year round and would love to have a gas grill. Good luck and let me know if you win! 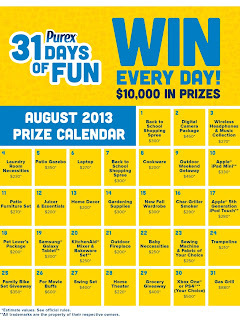 What prize do you want to win in the 31 Days of Fun? Even better news! One of my readers has the chance to win a $10 Amazon gift card. Enter via the Rafflecopter below. I am a Purex Insider and I am eligible for incentives for participating in this campaign. This is a really great giveaway-and I wish the best of luck to all who enter!! I love all of the Purex products so any of them would be good to win. I would love the movie buff prize. That would be a great thing to win! I hope I win one of their prizes. Pretty awesome goodies! I would love to win the tablet! I would liked to win the back to school shopping spree!!! I used Purex products, love it. I want to win the Laptop! I shared the giveaway! I'd like to win the Ipad Mini! I'd like the gas grill. Instagram link in RC is broken. The Fall Warddrobe! - and yep - I shared it. I'd like to win the Xbox One and I tweeted the contest!